Lindos is in every way a “lofty” place. It seems to detach itself from the world without relinquishing its omnipotent command. There are a number of remains of temples and the overlapping views through the columns richly multiply. There is also the circumstance of experiencing this on varied levels as these temples are constructed on a series of plateaus and ever-changing portions of architecture and site are seen as one ascends or descends the numerous massive stairways. There is a sheer drop from the further most sea side of the Lindos site and this seems to emphasize the surprising sense of solidity and stability which these columns have in spite of their precarious location. Lindos is an order that dominates firmly and aloofly. Rising serenely, it commands all about it and is in close communion with the heavens. We rode the little donkeys down the steep hillside to the pier where Manuel approached with the launch. Gaily, the drivers on their donkeys departed, shouting “adio” and tapping the rumps of their little beasts, swinging their legs against the little animals’ sides and making those special sounds, cajoling them to make the climb at a lively gait. We were filled with the experience of Lindos and soon after dinner we retired. Captain Andreas said we would depart for Crete at 3:00 a.m. in hopes that the Meltemi winds would be at their lowest force at this time. Captain Andreas had assured us that if the going got too rough, he would pull into a cove out of the high seas as soon as he reached the tip of Crete. For five hours, we pitched and rolled. The entire boat trembled as it poised itself on the crest of one great wave, readying itself to come crashing down into the next. At these times, the whole vessel shuddered with the impact and the violent rolling caused the entire interior of the boat to come alive with a constant creaking. I lay in my bunk near nausea even though I had taken the precaution of a Benadoxin. Even latched doors seemingly swung open, all that was not firmly fastened down was thrown about, and chairs above in the dining fell over and slid about until they too were firmly secure. 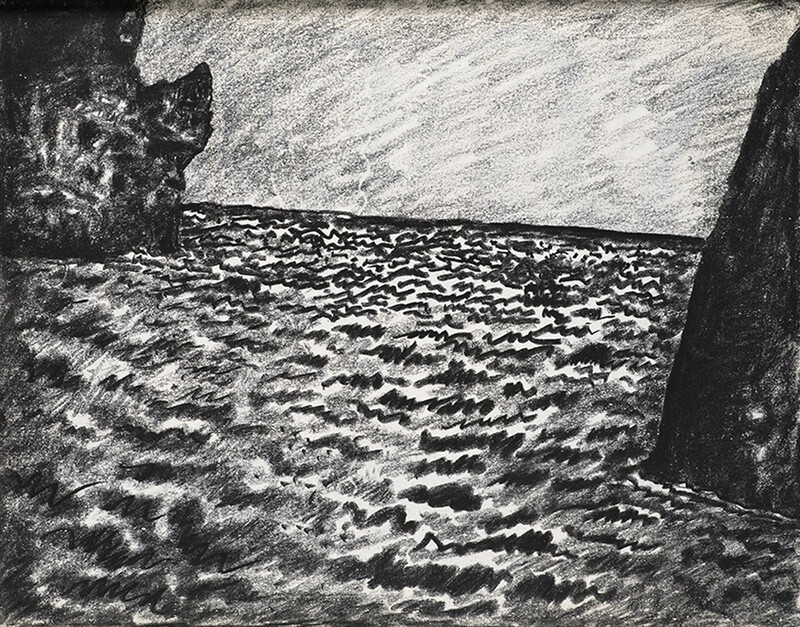 We were in the open sea and all we could do was proceed. At 5:45 a.m., John and Jerry came into our room. They wanted seasick pills and Linda, who was already sick, also wanted a pill to remedy her situation. Costa had dashed in at 5:00 a.m. to see that all portholes were firmly closed and indeed the water was splashing furiously against them. John told me the sea was cascading over the Daphni bow. He curled up on my bunk and we both fitfully tried to sleep. At about 10:30 we pulled into a protected cove, had breakfast and a relaxing swim. 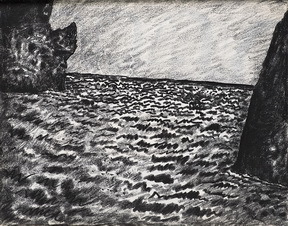 At 11:30, the captain again put out to sea, warning us that we might have a rough half hour subject to the unbroken force of the winds due to being in the open sea. He exudes knowledge and assurance and we leave all decisions concerning the boat’s schedule to him. At about 1:30 p.m. we pulled into a very small cove. We were to have lunch and wait out the intensity of the winds. We did not know that it would be necessary to stay in this forbidding little inlet of Kassos for 29 hours. We had hoped we could leave in the evening but could not. The next day was spent reading, resting and a little swimming. Mainly the talk was about whether the constant blowing of the winds had increased or decreased, whether the crashing rollers beyond the cove were more or less agitated than before. At 6:00 p.m., the captain said he felt we should chance it and that if it was too rough for the Daphni we would return. All on board were thoroughly alert. There was a tension to their attentiveness. We pulled out of the cove into the blustering sea and started a roller coaster path. Shortly afterward, the captain said that although it was quite rough he felt we could proceed. Furthermore, he reassured us, telling us that he had been in seas that twice as rough. Back I went to my bunk and to near nausea again. At midnight Captain Andreas pulled into a cove, out of the high seas, in order that we may have a snack (we had not had dinner) and we were not to take more than a half hour in order that we be underway again. Upon returning to my bunk, I took a sleeping pill in hopes of sleeping through the next part of our journey. Fortunately, I did and awakened to the decreasing sound of the Daphni’s slowing engines as we pulled into the harbor of St. Nicola in Crete. We were to drive overland to Heraklion (1½ hour drive each way) while the Daphni took on water and supplies. At about 2:00 p.m. our two taxis appeared on the quay of St. Nicola for our overland trip to St. Nicola. We were ready to start having had a refreshing swim and a delightful lunch (on board the Daphni). The trip overland to Heraklion was interesting. We passed through country dense with olive trees. The winding road took us through little roadside towns where it appeared the entire male population relaxed at tables outside small tavernas. We passed many weather-beaten farmers (they are as gnarled as the trunks of olive trees) riding little donkeys and their old women also on donkeys (sitting sideways). They looked at us intently—their eyes peering out from under a dark kerchief, their lumpy figures always clad in dark materials; either all black or a black blouse and dark grey patterned skirt. Our driver proudly pointed out the little town of [Greek actress] Melina Mercouri’s birth. We drove through a mountain pass dotted with the domes of numerous churches and finally descended to the level of the sea. The seaside road to Heraklion is not unlike the coast road in Santa Monica and Malibu, California. We passed a large U.S. radar installation and a U.S. air base. Happily, our timing was correct and we had a few minutes to enjoy a cool drink at a taverna in Heraklion before the museum opened (4:00 p.m.). The museum was an extraordinary experience. 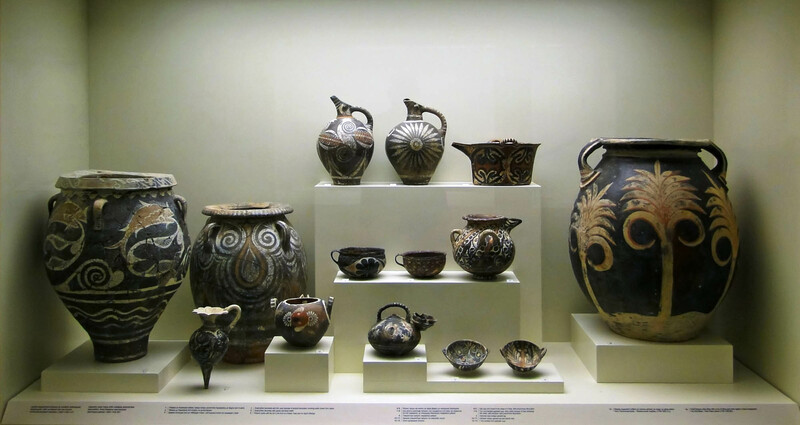 It houses ceramics, sculpture, painting and jewelry, which completely represent the Minoan culture—never had I seen pottery of such invention and diversity. I walked from one room to another, stunned by the marvel of this prolific outpouring. The jewelry was exquisite and showed, as did the painting and sculpture, the influence of Egypt. 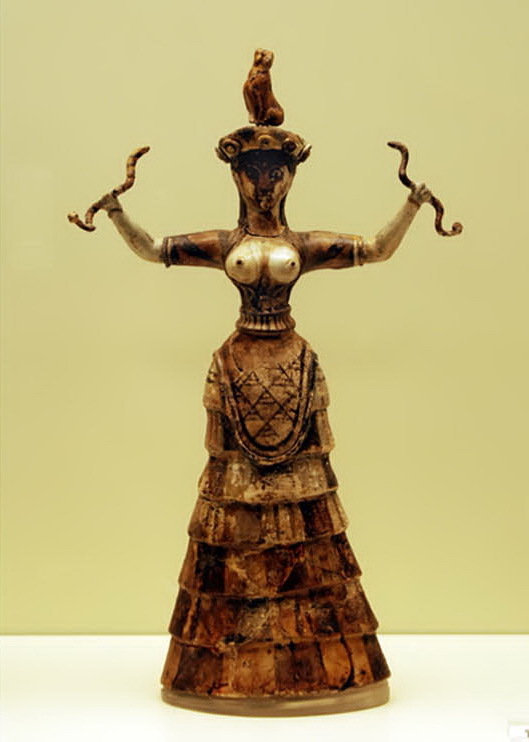 This influence is assimilated however and Minoan art appears far less severe than Egyptian. 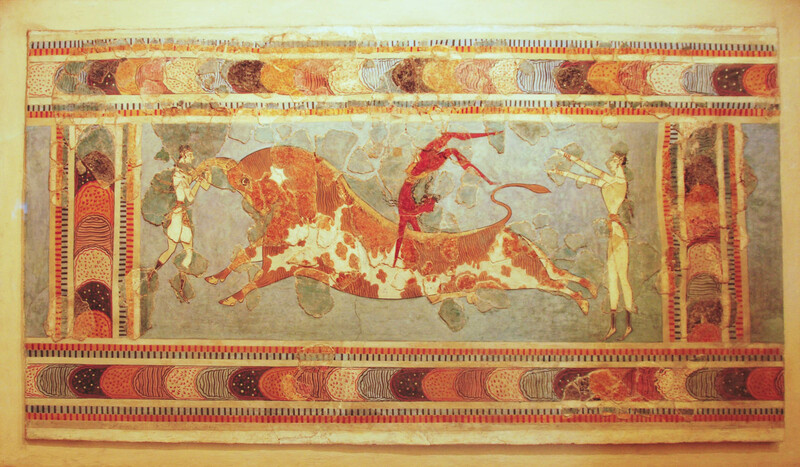 The presence of the enigmatic great Minoan ball is pervasive. Even in pots that bear no figurative reference overtly to animal form, the handles are mysteriously animated by an organic force, which somehow transcends their apparent geometric simplicity. The decorative embellishment is vigorous and has a conviction of intimate experience. Often the forms of octopus or dolphin in their natural habitat spread their infinitely complex patterns playfully over the entire surfaces of monumentally scaled jugs and bowls. At other times all manner of reed and leaf forms are the basis of the patterns. The play between three dimensional representation and actual relief is particularly inventive. For the most part, the frescoes in the museum are so greatly restored that it is difficult to ascertain their original quality. Humor and wit is also present and, in all, there is agility. It is most revealing that the scenes the bull vaulting ritual spectacles represent a miraculous aerobatic ability. We left the museum to visit the palace of Knossis. Although interesting, Knossis is disappointing because here too the restoration (although it establishes the nature of the original structure) is negative in character. Our drive back to St. Nicola in the twilight hours gave us an entirely different impression of the terrain we had passed earlier. The light of the evening in Greece tends to dematerialize space and at the same time expand it. A kind of quietude invests each color, shape, form and surface with a magical calm. This tranquility is not passive, it is an active force and I wonder to what degree this environmental condition contributed to that remarkable equilibrium and marvelous attainment, the harmonious coexistence of the spiritual and physical so insistently evident in the art of Greece. It was 8:15 p.m. by the time we returned to the Daphni. Time for a quick dip and cocktail before dinner at nine. Captain Andreas told us we would leave for Santorini at midnight. Up at 6:30 after a good sleep. Our trip from St. Nicola, Crete and Santorini, in spite of being in the open sea, was not exceedingly rough. We arrived at Santorini at 8:30 a.m. Sheer, steep slopes of the volcanic mountains surround the harbor of the island. In fact, an island just outside the harbor has come into existence quite recently. In 1929, a volcanic eruption occurred and an entire island of black lava surfaced. It is accordingly called the black island. 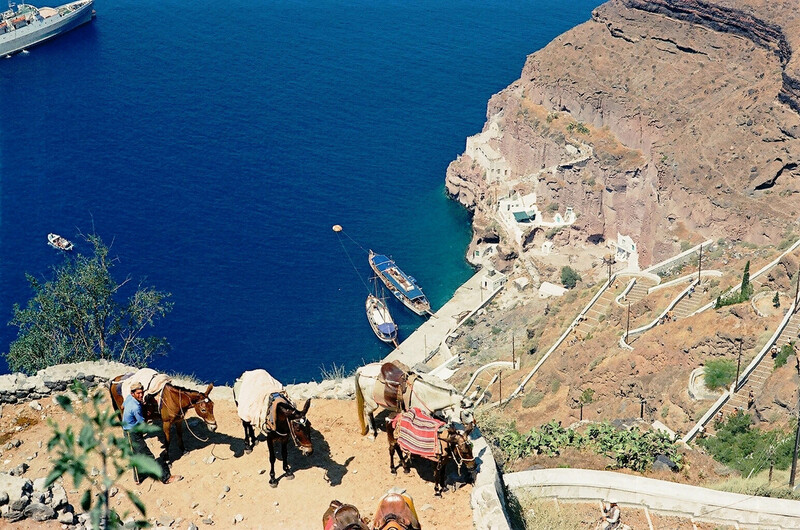 From the base of the mountain, upon whose crest the town of Santorini is situated, one ascends by donkey. Even though the tour ships had already arrived and there were many tourists in the town, Santorini is beautiful to visit. The town conforms to the serpentine spine of the mountain ridge. It is well kept and an intense white light reverberates from its pristine white walls. 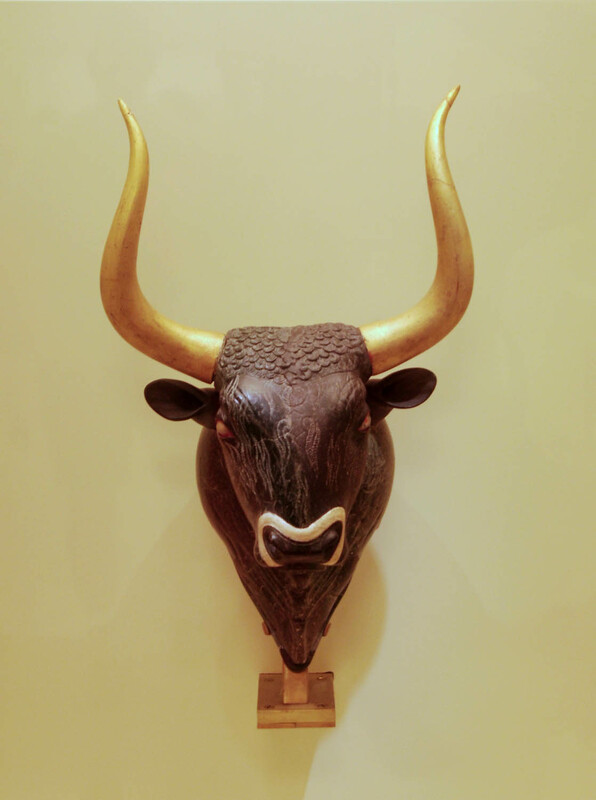 The small museum at Santorini has a number of works of fine quality. I started to take some pictures in the museum but was informed that it was forbidden, as the material had not yet been published. We slowly walked down the steep cobble or pebble stone steps that lead from the summit down to the pier below. It took us approximately a half hour and some of us were a bit stiff legged by the late afternoon.